Looking for end of lease cleaning Pascoe vale? Whether you lead a busy lifestyle or you are a tenant who regularly moves, you have probably at least once found yourself in need of a cleaning agency. Pascoe Vale cleaners are a team of well-trained and fully insured cleaners who can deliver regular, one-off or end of tenancy cleaning services. Our End of Lease Cleaning Pascoe Vale ensures 100% Bond Back cleaning. Hiring us is simple, easy and efficient. 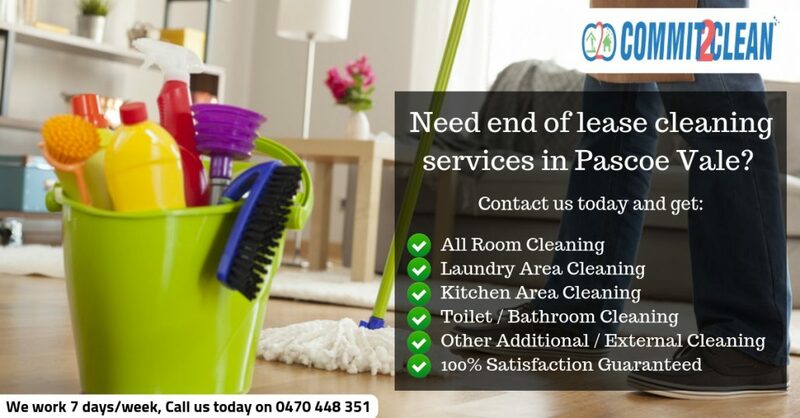 Commit2clean provide best end of lease cleaning services in Pasceo Vale. Our end of lease cleaning services are always accompanied by a cleaning certificate, which proves to your landlord that the cleaning that was undertaken has been executed in the most professional manner. We also offer regular or one-off carpet and oven cleaning for those of you who wish to get rid of the germs in the most efficient way. The services that the cleaners offer are carpet and vacate cleaning and end of lease cleaning in Pascoe Vale. They offer 100% satisfaction, which means that if a clients is not happy with the services provided, the cleaners will go back and clean free of charge. If you live in the Melbourne and you are searching for the best and most reliable cleaning team there is in Pascoe Vale, then please feel free to contact us. Our phone lines are open at all times and our customer service team will be glad to answer any questions you may have.